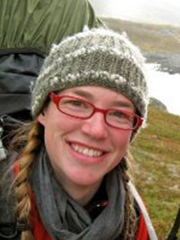 Stefanie Tofelde is associated PhD student in the International Research Training Group "StRATEGy" and a staff member of the research group general geology at the University of Potsdam as well as in the geomorphology section at the GFZ Potsdam. She holds a master degree in Geoscience. She is working in the Quebrada del Toro in NW Argentina where she focuses on the influence of climate on erosional and hillslope processes. She applies cosmogenic nuclide analyses combined with biomarker analyses.